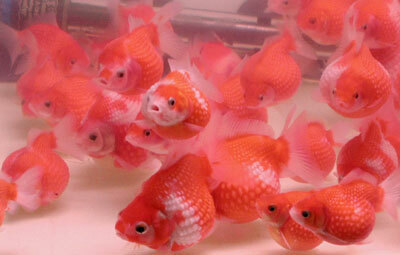 The Pearlscale Goldfish is an egg-shaped variety of goldfish. The body is short, stubby, and compact . It has a straight back and swollen belly, resembling a golfball, and is usually twin tailed. It has rows of distinct scales with raised centers and dark perimeters. 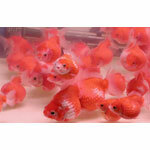 t is often easier to breed these fish in ponds rather than aquariums but both are possible. The female will lay her sticky eggs on plants and they should hatch in 48-72 hours. The fry are very small when newly hatched but will grow in size rapidly. Their coloration will remain brown like their ancestors, but after 12 months the adult coloration should show through.